Ta Da!! 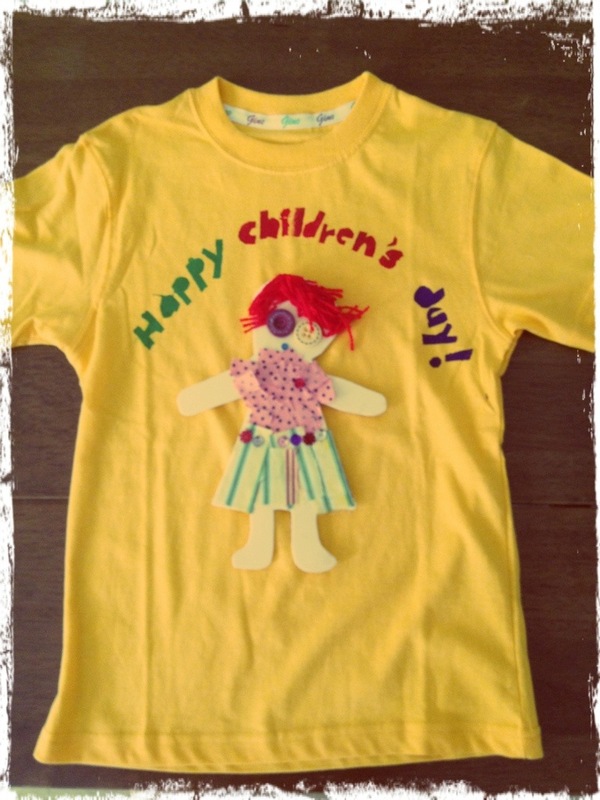 Her Children’s Day (which was last Friday) t-shirt. She can wear it next year as it’s really big on her. I’ve seen all the children carrying their T-shirts out of the room yesterday. She was holding hers gingerly at the top as the fabric paint hadn’t quite dried. 宝贝：I did it all on my own!! (she announced proudly) I’ll carry it home myself. Me : Great. Just don’t dirty the car or I’ll make you clean it up. By the way, why’s your Dolly’s hair red?? All your friends’ dollies have black hair. Me : Errr ok. But aren't the buttons too big for the face? (the eyes I've seen on other tshirts were made of smaller buttons or sequins). And she looks like someone punched her in the eye. 宝贝：Big eyes can see better!!! That's the makeup. And she's wearing a dress. After all, she's right. Why conform to the norm? Why does the sky have to be always coloured in blue? Why does the grass have to be green? Why does the dolly have to look like a regular girl? She can be a zombie for all I care! Adults like us have too many rules and conventions that we live by and we have forgotten how it's like to think out of the box and to be different from others. I hope creativity continues to thrive in my quirky little one. Maybe she will paint the grass pink next time! !